Waterplay® Solutions Corp. introduces Grasslands, a collection of aquatic play features that ignite imaginations and bring waterplayers back to nature. Waterplay® Solutions Corp. introduces Grasslands, an exciting nature-inspired group of products designed to transform any aquatic play space into a world full of wonder. With tall blades of grass and wildflowers, friendly insect characters, smooth surf stones and critter-shaped ground sprays, these products complement Waterplay’s revolutionary Discovery Stream, released earlier this year. 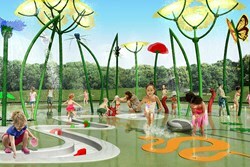 With the release of Grasslands, Waterplay is adding more than 20 products to its aquatic play features line. There are misting and dry grasses at different heights and a Dew Drop dumping bucket that makes a splash. Three types of spraying wildflowers are included—a swaying Corn Poppy, an interactive spinning Blue Bottle and an Aneth Bloom, which provides shade with its blossoming canopy. Grasslands also introduces a cast of characters—Sparx the dragonfly, Flutter the butterfly and Charlotte the spider—just waiting to make new friends. The surf stones, some spraying water and some not, can sit alongside a Discovery Stream, just like a natural stream. Finally, Grasslands incorporates interactive ground sprays—Ants, a Frog, a Gecko and a Snake—with a smart, flush-mounted design. Designed by Markus Ehring, world-renowned public designer and owner of numerous innovative patents, the collection of Grasslands products are visually stunning and cleverly designed, from a spider that weaves a web of water to the modular Discovery Stream that can be configured to fit any space. Inspired by nature, designed for fun, Grasslands is now available to the global market.